2) By testing all combinations of three different dimensions chosen from the set of W-values (1) to find those combinations, of which one or more resonances match all of the first 12 notes of a major scale, from C5 (or B4) downwards. This computation is repeated for each of the 12 possible key-notes; matching goes down to E3, or F3, or F3#. This lower limit has been chosen to set a severe, but not impossible, criterion: it is perhaps also about as low as many baritone voices go. Combinations selected as above (in Table 1) are found only for the following keynotes: C#; D; D#; E; F; F#; and G. The following specific sets of dimensions found are listed in Table 1, together with listings of (a) those notes, of the 15 that comprise the two octaves from C5 or from B4 downwards, that are ‘missing’ from the ‘spectrum’ of resonances of the given chamber, with those dimensions, and (b) the ‘extra’ resonances of that chamber, lying within that range, which coincide with semitones other than members of that major scale. In each of the 13 cases shown in Table 1, the ratios of dimensions A/C and B/C have one or other of four pairs of values; i.e., the study reveals four different room-shapes which match well to major scales. Table 2 gives these shapes and the ranges of keynotes which they respectively cover. Table 2 shows immediately one advantage of Shape IV over the other three, viz., that in different sizes it covers a keynote range of 4—and not only 3—semitones. This is equally to say that in one size it covers a four-semitone range of pitches for the two-octave range to be matched (here taken arbitrarily to go up to C5). 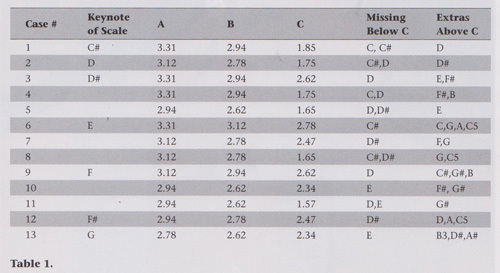 A review of Table 1 shows moreover that Shape IV is equal with Shape II in missing only one note of the two-octave interval; and superior to it in providing 3 and not only 2 ‘extra’ semitones which might well match ‘accidentals’ in a melody. The dimensions of Case 9 viz., 3.12m long (say) x 2.94m high (say) x 2.62m wide, for example, are close to those of bathrooms found in many suburban houses and town-houses. Architects might with some advantage adopt these dimensions as they stand, or perhaps scaled up or down to accommodate, say, a certain ceiling height; and therefore offer their clients bathrooms fit for a king to sing in. However, especially if the bathtub is not sunken flush with the floor, the resonances of a real bathroom, complete with excrescences, may not match exactly enough the sets here discussed. Some direct experimentation seems called for.